It’s probably hard to get a word in edgewise around this couple, as they love to talk, philosophize and question. 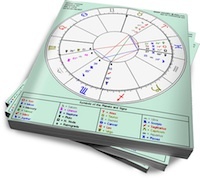 Like in a fast game of ping-pong, Venus in Gemini and Mars in Sagittarius are constantly engaged in an ongoing dialogue. This interplay can be fraught with tension and conflict, or provide fuel for the very chemistry that keeps them together for life. Boredom is never an issue with this air and fire hybrid; instead, their real challenge is finding a peaceful place to meet in the middle so that they don’t wear each other out. Venus in Gemini brings a light and airy touch to love. In her highest form, she shares the wit and verbal skill of a modern day Shakespeare. She seduces with words and ideas, wanting to connect to her lover in the realm of the mind. Overly emotional displays of affection will cause this Venus to pull back, as she shies away from too much intensity and depth. Keep it light, and Venus in Gemini will flutter around like a pretty butterfly, sharing her colors and beauty for everyone’s enjoyment. Though sometimes fickle, this Venus can settle down when she finds a partner who challenges her mind and intellect. Mars in Sagittarius is straightforward when it comes to the realm of love. No beating around the bush with this fiery Mars – when he wants you, he’ll let you know. Though he may not thrive on commitment, he’ll always make you laugh, since humor is one the greatest gifts he brings to a relationship. This Mars values freedom and exploration in love and does not appreciate attempts to tie him down. Venus in Gemini appreciates Mars in Sagittarius’ curiosity and honesty, and is stimulated by his need to “know.” Mars in Sagittarius thrives around Venus in Gemini’s light-hearted approach to love. Though their differences may create friction, they also keep things interesting, making it easy for this couple to stay involved. How about a Venus in Sagittarius, Mars in Capricorn combo? I’ma Gem woman with Gem Venus and I’m crazy about a Cap with Sag Mars. But he’s not letting me know how he feels so far. I blame that on his Cap Sun. He’s been very slow to reveal anything like that. We do talk. A LOT. Just not about how we feel about each other.